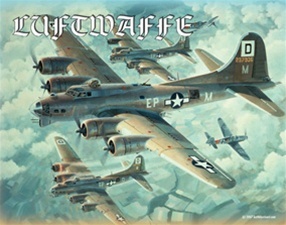 Luftwaffe is an update of the classic Avalon Hill game covering the US strategic bombing campaign over Europe in World War II. As the US commander, your mission is to eliminate key German industrial complexes. You select the targets, direct the bombers, and plan a strategy intended to keep the Luftwaffe off-balance. As the German commander, the entire arsenal of German aircraft is at your disposal against the finest in Allied designs. Turns are quarterly, with German reinforcements keyed to that player’s production choices. Units are wings and squadrons, and they’re rated by type, sub-type, firepower, maneuverability and endurance. There are rules for radar, electronic warfare, variable production strategies, aces, target complexes, critical industries and diversion of forces to support the ground war. Beyond that, the original, classic game system remains essentially sound and hasn’t otherwise been changed much. Most of the upgrade was in adding in additional rules, revising the order of battle, and adding more deployment and industrial options. The reverse side of the units now represents a condition of loss of effectiveness, rather than loss of material strength. That’s due to a combination of factors: damage to aircraft, an infusion of novice pilots, or to veteran crews suffering combat fatigue. Historically, pilot training and morale were critical factors, and the game now shows that. Replacement points represent not only new aircraft but also logistical support, rest and relaxation time for aircrews, all of which are used to restore fatigued units to good morale. Fatigued units count the same as veterans for stacking on the assumption that a shot up or novice unit would be more difficult to coordinate in the air. The orders of battle are much the same as in the original game, though the German player now has to plan ahead if he wants to get jets. We added a US P-61 unit. While P-61s were historically used mostly as night fighters, the USAAF based two groups in France and used them as intruders, so they can be useful in attacking German airbases. The Americans also get a “Droop-Snoot” P-38. They were P-38s that had their guns replaced with a bombardier and were used as light bombers. While only a small number were built, they were effective as bomber-leaders, so they’re included in this edition. The German player can now increase his ability to stack by expending fuel points, representing training pilots in large-unit formation tactics. The US player doesn’t need to do that, since they had a much bigger training base as well as unlimited fuel. Since the Germans now get additional oil, owing to a more historic evaluation of the Ploesti fields, they can maintain an effective fighter defense as long as they can preserve that reserve of fuel. 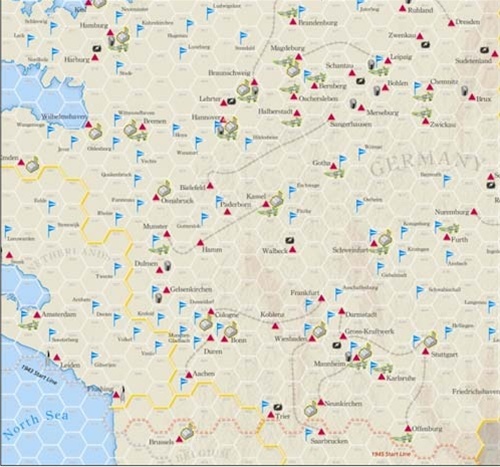 There are also other new targets on the map, such as the Germans’ power generation grid. In the original game the US player had to bomb all the targets on the map to win. Given the way the victory point system now works, the Americans need bomb about four out of the five major target systems to win, thereby duplicating the historic result.